The well known Worked All Continents (WAC) is a popular award that represents an easy entry into the pastime of Amateur Radio awards hunting. But the International Amateur Radio Union’s (IARU) version is not the only game in town. 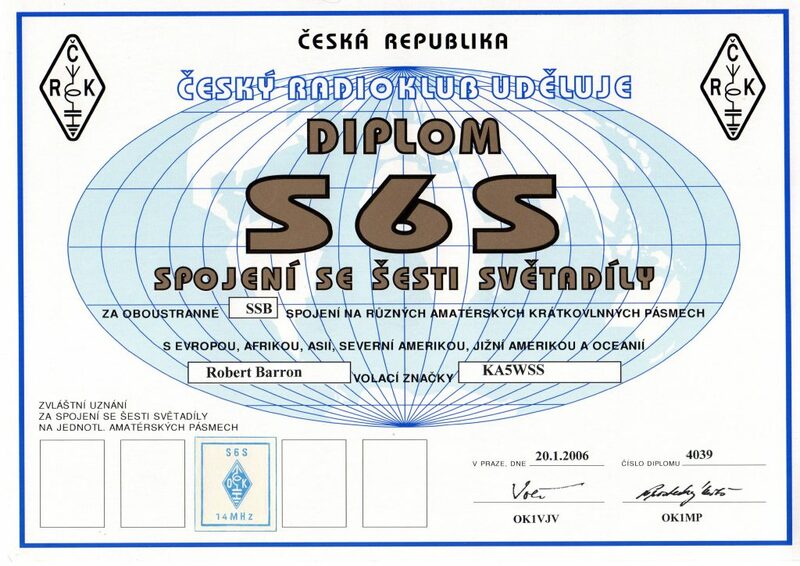 Like the popular Worked All Continents award, the Czech Radio Club’s S6S award does not require a contact with Antarctica, which makes the certificate a bit easier to obtain. Unlike the WAC certificate, the S6S version does show the lost continent on the world map. So there’s that. And there are endorsements for the main HF bands (80, 40, 20, 15 and 10 meters). A feature I like about the S6S certificate is single band endorsement spaces right on the certificate. With some other awards endorsement stickers can look out of place and a bit messy. The stickers here each have a proper place with spacing guides to keep everything orderly and neat. Very nice. As of 2019, the fee for the award is $8.00 with endorsements going for $2.00. QSL cards may be sent but need not be when “the national Amateur Radio Society has confirmed possession of the listed QSLs by the applicant”. That is a bit open to interpretation, but DXCC awards checkers might be able to fill in for this purpose since they are sanctioned by the ARRL. It would be best to check whether or not that assumption is correct with Czech Radio Club awards people before sending anything through the mail.